Instructions should be revised . Support bar should be hung before guides and rails . Some splash out but not to bad . Looks great !!! The DreamLine Essence frameless sliding bypass shower or tub door showcases a modern, elegant design with a striking silhouette. The Essence provides smooth gliding action with its sleek rollers without the significant framing of a typical bypass shower door. Step into a stunning oasis every time you shower! Choose DreamLine for the ultimate solution for your shower project. Dimensions 1.0 In. X 48.0 In. X 76.0 In. Had a glass door Company install. Almost as good as his $2500 shower door. Only thing different is his Chrome is solid. You have to be careful shutting doors. Glass will break. I would purchase again. 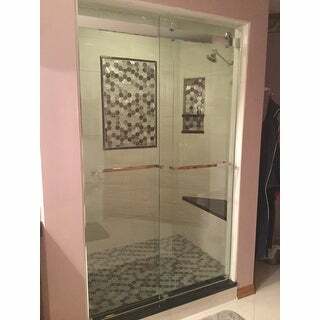 This shower door is beautiful and arrived quickly.... However, I am giving it only four stars due to the delivery issues. Firstly, the delivery window was almost all day, plus the movers would not even bring it up the driveway... and the package was huge and heavy! Very heavy. The package arrived quite late, and as indicated was left in front of the house. No damage, but difficult to move to the basement bathroom due to size and weight. Very modern look, we will be happy once we get it installed. Looks nice, getting ready to install. Very narrow side frames which was what I wanted. Arrived in one piece, nothing broken. Anxious to see them put up in the bathroom. My contractor reviewed it and said OK.
Good price and the product fit my need .